[Doragasu] got his hands on one of these WM8650 Netbooks for around 50 euros (~$63.50) delivered. They come with a version of Android preinstalled, but he wanted to use them more like a computer and less like an Android device. So he set out to load Arch Linux on the ARM-based Netbook. This is possible because the hardware inside is actually pretty good. The 800 MHz SoC is accompanied by 256 megs of RAM. There’s 2 gigs of internal storage, a 7″ display, USB, Ethernet, WiFi, and an audio system. This is comparable to what you’d get with a Raspberry Pi (without video acceleration) but also includes all of those peripherals, a case, a touchpad and keyboard… you get the point. There are several patches that need to be applied to the kernel to get it working with the hardware. [Doragasu] covers each of them in the post linked above. You can also hear his presentation in the video after the break. If you’re going to do this, be wary of updates. The newer initscripts does not like older kernels lacking devtmpfs. The kernel shipped with the Android distro, didn’t support devtmpfs, and that caused udev not to work properly. For that reason I had to recompile the kernel, including devtmpfs support. ;-). It works great with latest Arch Linux init scripts. Is there any way that you can use the stock android kernel to run Arch Linux, or at least some of the kernel modules? (no keyboard or screen however). The next closest thing would be the “Allwinner A10 netbook” for ~$80. But it’s only for sale in china at the moment. think that statement is way off. The above is comparable to what you’d get with a Raspberry Pi (WITH video acceleration, similar footprint, etc). Just to clarify, the SoC indeed has video acceleration, but only 2D. Forget to run Quake 3 in this device, but you can play 2D games. It also has a DSP for video/audio decoding. How can i buy this alwinner A10? i’m heading for china tomorrow. do you have any links or info? Alwinner A10 is the processor (and always bundled with Mali 400 gpu). Chinese call it “Boxchip”. They use it in everything from mini PC’s, tablets, gps devices, etc. There’s also the A13. Be careful as that one is cheaper with similar specs, but doesn’t have HDMI out support. SZ SEG (赛格广场) seems to be the most popular place, but I would imagine other big city markets are similar. These specs look pretty similar to your average chinese android tablet, maybe somebody could get a real linux distro on a cheap tab using this technique. I really have to learn to read. :) Thanks, I’ll check out the link. Linux? On a COMPUTER? Blasphemy! Watch about 5 seconds of your video. You have to learn to speak clearly! I’m glad you ended that with /sarcasm or none of us would have been able to tell. are you really glad, or just being sarcastic? When will people learn? Memory matters! Only thing that makes these things unusable is lack of sufficient amount of memory. Almost 2 years ago I bought several ‘chi’-pads with the same SoC and I ported the linux kernel. I even had a rudimentary X session running. The problem was that the build quality of these tables was so terrible I had to give up because my hardware got unusable. Both had batteries that were obviously faulty (completely expanded like a balloon), so I removed them. Later my expansion connectors (which gave me usb, ethernet and most importantly serial access) broke off taking some traces with them so I could not solder them back. The last I remember was both not even turning on anymore. I hope these netbooks are a bit better built, because I think it is still a nice SoC. My tabs were around 400 rmb at the time, so no real surprises about the quality. i’d perhaps buy one to run linux if they were a bit less ugly. really? is that really your argument? finally we have some cheap netbooks with ARM SoCs (not the crappy MIPS that have been around for some time) able to run Linux out of the box, and you are worried about their prettiness? paint it black and fill it with HaD stickers, who cares?? being ugly also means ugly keyboard… and sideways mouse buttons… they just went way over ‘ugly’. i will pass too. and i doubt battery life with those cheap components will be any better than atom. Someone needs to do this with the exact same ones that are running Windows CE that are even cheaper out there. Unfortunately the el cheapo windows CE thingies out there only have crappy SoCs (according to today standards). The CE kernel was never optimized to go beyond the ARMv5 and ARMv6. Even for ARMv5, the kernel was compiled using the old ARMv4 instruction set (trust me, I disassembled the CE kernel). I just have no idea how to get it to boot some Linux on it… it is good to see people giving new life to what would otherwise be trash hardware! 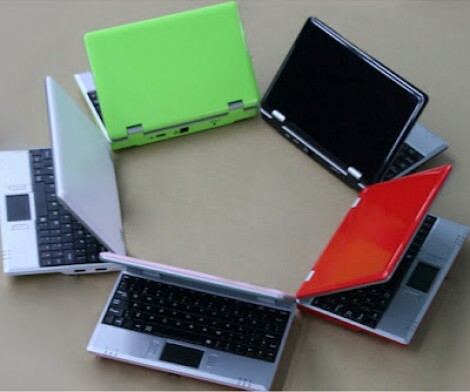 They have the New 7 inch Android 4.0 VIA 8850 DDR3 512M 4GB HDD HDMI Camera WIFI RJ45 Netbook Laptop Notebook, Is this the upgraded one?